Join us for a special tour of the “Jenga” tower in Austin. 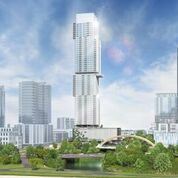 The Independent, called the Jenga tower by some because of it’s cantilevered design, will stand 58 stories tall and contain 370 condominium units. Once complete later this year The Independent will not only be the tallest building in Austin - it will be the tallest residential tower in Texas and could be one of the most environmentally friendly buildings in the city with a LEED Gold Certification. Green additions to the building include: rain water gardens, water collected from the AC units to irrigate the site, and special glass windows to keep the sun from heating up the units. Inside there will be two full floors of amenities including multiple roof decks, an infinity swimming pool, theater room, business center, concierge service, dog grooming station, children's playroom, and much more. The front of the building will become a public plaza and crews will redevelop the Shoal Creek Trail with lights and benches and connect to the yellow pedestrian bridge and the Hike and Bike Trail. In addition the entire first floor of the building will be retail for local businesses that reflect the nature and character of Austin. Preregistration and on-site sign in are required for this tour. Limit 25. Watch the tower's construction progress HERE. Available for CEUs; certificates will be provided.